It is impossible to fully explore a region during one holiday, but we hope to provide an experience that will illustrate the richness of the heritage and culture that is Burgundy. Burgundy is the heart of ancient France. 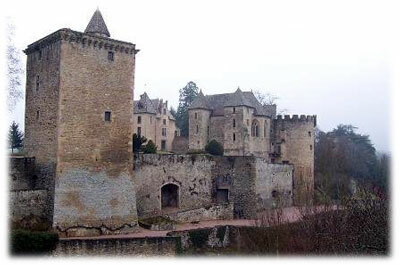 It was the center of the Roman presence in Gaul, the seat of the Dukes of Bourgogne whose power at one time stretched from the Netherlands to Spain. Evidence of those times still exists. 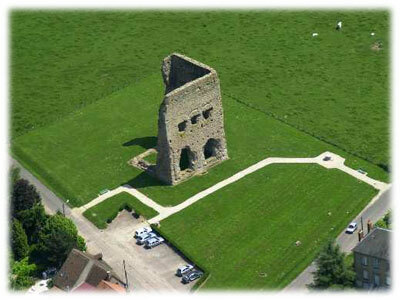 The height of the industrial age has also left its mark on the area. Although much of the industry has moved on, they have left behind the mines and foundries that added to the wealth of the region. Today, Burgundy is a tapestry of all that went before and now represents the essence of all that is France, in history, culture, and gastronomy. In ancient times Burgundy was the seat of Celtic power. It was in Burgundy that the legendary Gallic hero, Vercingetorix, met his match against Julius Caesar. Burgundy abounds with the reminders of Roman occupation and nowhere is this more evident than in Autun which was founded in the 1st century BC. Autun is a derivation of the original name, Augustundum, after the Roman emperor Augustus. Autun today is layered with the patchwork of history. The list is almost too long to recount, but pre-Roman remains include the “Pierre de Couhard” overlooking Autun. Roman remains include the longest Roman wall existing in France, the original Roman gates of Porte d’Arroux, and Porte Saint Andre, and the remains of the amphitheatre. The Cathedral St. Lazare whose first stone was laid in 1120, and whose magnificent Tympanum was completed by a single artist between 1130 and 1135, is a masterpiece of Romanesque art. The medieval Tour d’Ursulines and many buildings in the “cathedral district” are only some of the remaining medieval structures that are interspersed with the more “modern” buildings of the 16th and 17 centuries. The Rolin Museum has on display statues and exhibits from Roman through medieval times, as well as 18th century paintings by artists such as Ingres. Napoleon passed through Autun twice in his life. As an adolescent he attended school at the “Lycée” before continuing on to military school and history. The school still exists, although it is now a public school. Napoleon returned to Autun on his way to Paris after his escape from Elba. Legend has it that he threatened to raze the town after the local politicians, who were none too pleased to see him return, failed to greet him with acceptable pomp. A band and welcoming committee were quickly rounded up to the satisfaction of all. The building in which Napoleon stayed exists today, as it did then, as a hotel. More recent history is perhaps less noticeable here although the huge Croix de la Liberation on a hill overlooking Autun honors the resistance movement during the war. The Burgundy region was a principal center of resistance. The resistance fighters, known as the Maquis, were especially active in this area, and although the surrounding hills helped hide them, many paid a high price for their efforts. Memorials to the fallen are frequently seen on our bike travels. As old as is Autun, even older is Bibracte, the town that was eventually abandoned in favor of Autun. Bibracte is an astonishing archaeological site. A Celtic city that at its peak held 10,000, it was in the winter of 52-51 BC at Bibracte that Julius Caesar wrote much of his Commentaries on the Gallic Wars, still one of the most important sources of information about this region and the times. A visit to the digs and the museum is a must. Burgundy has been called the water table of France. The Seine starts just north of Dijon, The Loire flows along Burgundy’s western border, and the Saone flows south along the eastern flank. Many smaller rivers and streams feed these larger rivers and all add to the lushness of Burgundy. 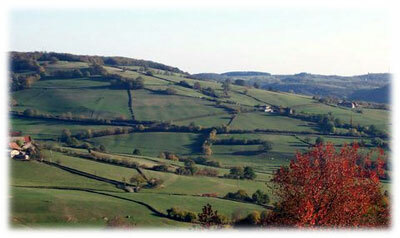 Dominating the center of Burgundy is the regional park of Morvan. This stunningly beautiful park, with huge forests, rolling hills and pastoral valleys beckons hikers, cyclists, horseback riders, and nature lovers. 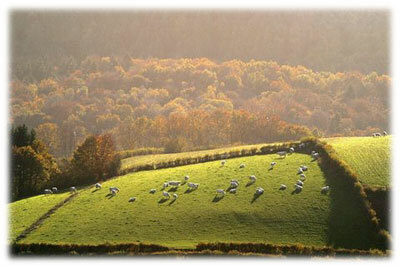 Morvan in Celtic means “Black Mountains”. Despite the name these green hills are most inviting. On one of the highest hills of the Morvan is Bibracte. The residents of Bibracte relied heavily on the timber available from the local forests. Today the forests are well managed, and under strict controls timber remains an important industry. Oak from the Morvan is still made into the wine barrels used by winemakers today, as in ancient times. 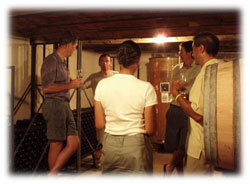 Burgundy is known as one of the gastronomic centers of France. Mustard from Dijon, Beef (Boeuf) Bourguignon, Coq-au-Vin, Escargots, all originate in this region. The Morvan area is home to some of the best cured hams and sausage you will find. It is also an area known for its cheeses such as Epoises, Brillat-Savarin, Delice de Bourgogne, and many others. You will also find many artisanal goat cheeses for sale from farms along the rural roads. Of course one of the region’s better known exports is wine and while Autun is just to the west of the famous Cote d’Or, many wonderful vineyards between Autun and the heavily visited wine district of Beaune, produce wonderful wines that are yours to discover.